Ever have a ‘who me?’ moment? You know, where you can’t believe someone just said that about you? I had 2 last week that have inspired this post that were almost identical. This of course, set me to mulling it over in my head and journaling about it to sort it all out. Ha, ha, ha, ha! I was thinking “what? Who ME?” I mean don’t get me wrong, I’ll take the compliment. But truly, is there another Bonnie here? Because you my dear lady have got to be joking! She wasn’t. Cue the surprised look on my face. Folks, in my head I’ve got so many tabs open, so many thoughts, ideas and stuff going on that it’s crazy town in here. Do you want to know why I seem like I’m all calm and zen and all that good stuff most of the time? It’s my desired state and I work at it. Some days I work really, really, REALLY hard. I do the work every single day and it does get easier, but I know for a fact that I am definitely NOT there all the time – by any means. However, I can get back to this state of peace much faster than I used to. So, I realized that many folks also desire this state, but have no idea how to get there in a healthy, productive, reproducible way. I’ve worked at this for years, sometimes by choice, sometimes for my own mental health and survival. But, it is work. This is what confuses the situation. I think a lot of people believe that living from love, and a state of peace as your default is a character trait that we are born with. Heck I’ve had people suggest it’s because I don’t have any ‘real’ problems in my life. (and that’s so the opposite of true that it’s almost comical). Let’s be really clear okay? EVERYONE has their baggage that can weigh them down, everyone has pain and times of despair and everyone has days where they just feel like they cannot do it anymore. Every. Single. Person. More importantly, you can absolutely, 100% learn how to respond differently to these events so that you too can return to your desired state more quickly. This is some serious truth lovelies. Read that again okay? You can. Now the how…well that’s a step you need to be willing and open to taking. It’s also work. And lots and lots of practice. The first step is to cultivate your self-awareness. Oh I’m sure lots of you are reading this and saying self-aware? Got it. Ha! That’s not a destination lovely, that’s a way of walking down the road of life. There is so much to keep uncovering and so many layers. Keep digging! Self awareness is a never ending joyful practice. The reason this is so important is you must learn to acknowledge what is yours, what is their and what is ours. You can only ever change what is yours and more importantly that is all you are responsible for. Drop the baggage that doesn’t belong to you. Give it back to whom it belongs and walk away. The second is to know exactly what your desired state is – right now. The truth is you are already doing things that keep you gravitating right back to your desired state. The only thing is you may not be aware of what that state really is. Some of us say they want a calm peaceful state when asked, but deeper down this isn’t exactly the truth. Calm? Happy? Angry? Truth time folks. Some of us like being angry because it’s familiar and we know how to BE in that state. It feels comforting. Strange to say? Well, get to examining. Some of us feel comfortable being a victim, being defensive, righteous, blaming…it’s not our ‘natural’ state exactly. It’s a familiar one. I know it’s not fun to do this part of the work. Still, it is essential. You don’t need to share this type of deep honest examination with anyone else, but you must (I repeat MUST) be this painfully honest with yourself. You cannot ever get to where you’d prefer to be, if you don’t examine and get real about the place you are in this moment. 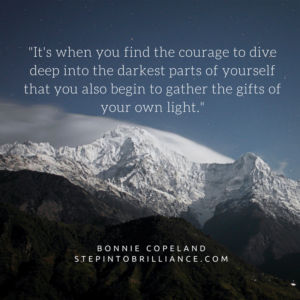 It’s when you find the courage to dive deep into the darkest parts of yourself that you also begin to gather the gifts of your own light. Once you work through that (and you will work through it over and over again), it’s time to learn some skills to change where you are. Learn them and practice them. Practice them a lot. But don’t worry! Life will give you tons of opportunities for practice. A perfect example of this (one I love) is when I was working with a group of rather exuberant kids. I was teaching them belly breathing over the course of a few days. One day, I was extra tired, they were extra busy and extra loud and I was starting to feel like I was losing it. I stopped, closed my eyes and just took a deep breath or two to calm my inner Self and return to my center so I could continue without losing my mind. I hear one little boy hush the other ones and say ‘stop it, can’t you see she’s breathing”. I’m not where I want to be yet. Mostly because I keep discovering so many more beautiful levels and layers that I aspire to. Right now, I know I don’t enjoy being angry, stressed or in a whirlwind of emotions. I like calm. I like happy me. However, life enjoys throwing those proverbial curve balls, stuff happens, grief, frustration, mishaps happen. So I practice my techniques to return to center, I keep learning and keep loving. The truth? I really do struggle some days and I don’t always succeed. There are still times I think about piling the dog and cat into the car and driving to a mountain cabin and hiding out and just forgetting about the nonsense of the world, but those times are happening less and less these days. So I’ll take the compliment as a sign that my hard work is paying off. What is your desired state of being? How do you want to feel? I’d love to hear what YOUR practice is to return there when you get thrown off course.